So Zoella recently launched some Christmas items and while I'm someone who disagrees with such sort of shopping until after Halloween the Secret Scenta set caught my eye. I mean 4 mini bottles of perfumes each with a different scent..where do I sign up!? I didn't even realise you could order these off Superdrug until I saw Hannah from HannahHeartss tweet her blog post about it where she had linked everything from the collection. So therefore I am blaming Hannah for the money I spent in Superdrug because I ordered a lot more than just this! You can find Hannah's post on the whole collection here, be warned though you'll just end up wanting everything. In the set you get a mini Blissful Mistful, Let's Spritz, Sweet Inspirations and Bake My Day. Before purchasing this set I had only ever tried the Blissful Mistful body mist. I had tried products from the tuti fruiti range (Let's Spritz was part of) so knew what the scent was going to be like. So Sweet Inspirations and Bake My Day were the new surprises for me. As these are body mists they don't last as long as a perfume however I do find that they last a few hours (at the most 4) before you have to re-spray them to get the scent again. Personally I love body mists to carry around in my handbag for throughout the day, and because these are minis they are absolutely perfect for popping in your bag. Starting with Blissful Mistful which I had owned the full size of, although I did use it up so it's long gone. This was the original scent brought out with the first range of products released. This is a very soft scent, one of those that when I smell it I feel really relaxed. It includes things such as Grapefruit, Violet and Jasmine. The Jasmine is definitely a main contender in this and it's just a gorgeous feminine scent. Lets Spritz is for those of you who like a fresh scent. While it is described as fruity with notes of Raspberry and Cassis, I find it very floral like. This is definitely a perfect scent for during the day as I actually find it to be the strongest scent out of the four. However it's not overdone and they've found the perfect in-between balance. Sweet Inspirations was a new scent for me, so I was exited to get my hands on it and smell it. I hadn't got anything from this range (until this Superdrug order) so the scent was going to be a total surprise. This is without a doubt the sweetest scent of them all. With such things as Almond and Vanilla notes with some Honey thrown in it makes the perfect blend of sweetness. I can definitely get a strong hint of Vanilla and Almond from this and I think it's the sort of scent you'll either love or hate. And finally the newest scent thats been released for Christmas time, Bake My Day. Theres no other way to explain this other than it just smells of Christmas. Ginger, Vanilla, Cinnamon and Chocolate all wrapped together and it just instantly reminds me of all the Christmas candles that do be lighting around the house. If you love Christmas scents and all things spices then you'll basically want to bathe in this scent. Personally I don't like spices, or christmas (i'm basically the grinch) but my Mum absolutely adores the scent and has been using it ever since I got it. But just because it's not my cup of tea doesn't mean it won't be yours! The set of 4 cost £16 which worked out at €19. Depending on your currency it works out at 4/something for each bottle which really is not bad at all. Of course being the mini fanatic I am I had to buy these and the price tag was the least of my worries. 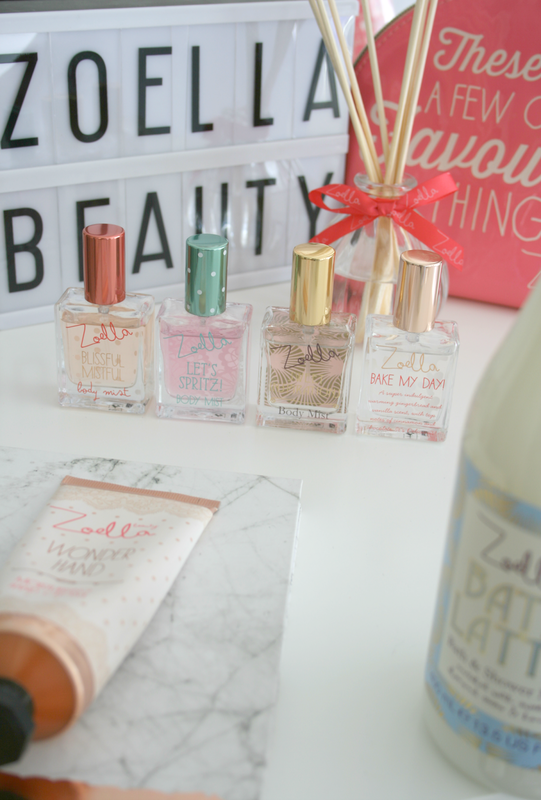 I do love the Zoella Beauty range though as it's affordable, pretty and so darn instagram worthy. I specifically bought these just to sit on top of my dresser because they're so cute they just deserve to be seen at all times. 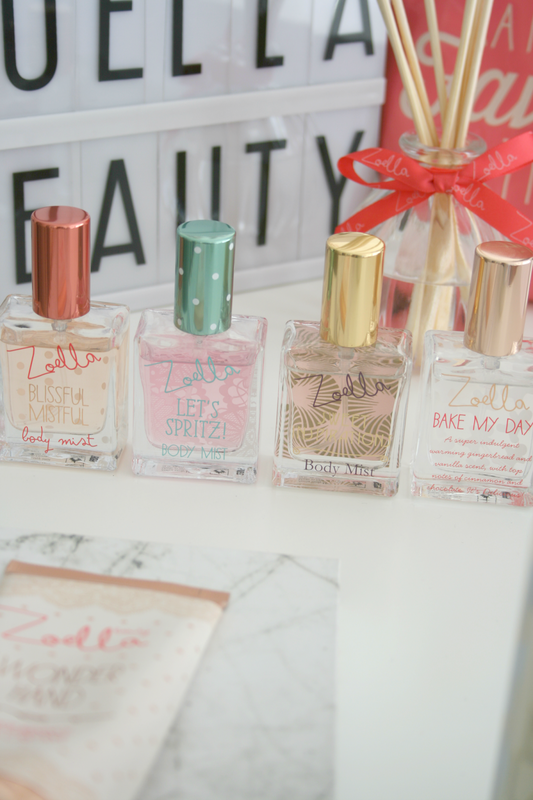 Have you got your eye on any of the Zoella Beauty products?